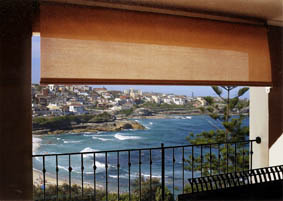 System 3000 straight drop fabric roll-up awnings are very robust external sunscreen systems. It is either operated by a crankhandle and gearbox or can be motorised with wireless remote. The System 3000 awning has no side guides or channels, so it does not interfere with architectural fretwork and post mouldings. 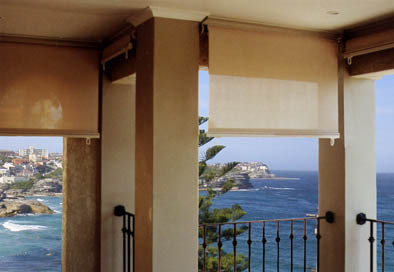 European design has taken the traditional external drop blind and developed it into a simple yet stylish product. Operation is by means of a gearbox on the end of the roller or a motor. For manual gearbox operation a crank handle is used to wind the gearbox and raise or lower the blind. The gearbox operation of the System 3000 blind eliminates the untidy ropes and pulleys of the of the traditional Verandah Blind. This combined with the 6061 extruded aluminium base rail and top rolling mechanism gives the awning a contemporary smart appearance. The System 3000 Awning can be anchored to the railing or the ground by means of the eyes on the base rail to secure it in the wind. A perfect solution for protection from the sun or as a screen if privacy is an issue. Enjoying the outdoors is a favourite past time in Australia. 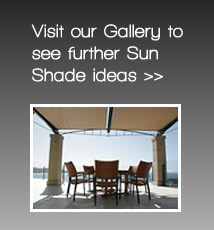 The 3000 SYSTEM will help make your outdoor area more liveable. 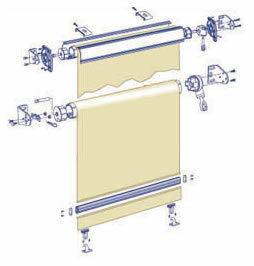 OPTIONS: The 3000 SYSTEM can come with or without an elegant aluminium cassette to protect the fabric when retracted. Motorisation is also optional. Suitable for all fabrics including canvas, acrylics, mesh and PVC.